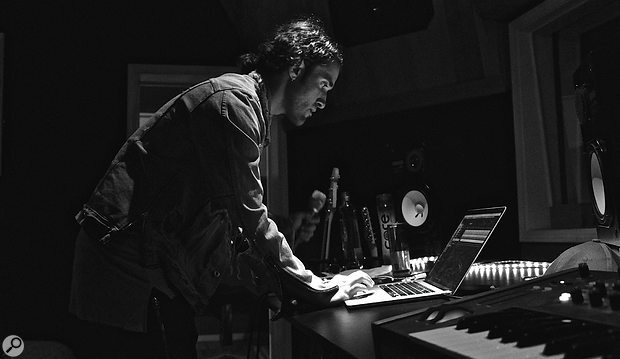 Engineer, mixer and producer Carlo Montagnese likens his work with the Weeknd to painting — and he’s not afraid to use plenty of colour! After another pause, Montagnese unburdens himself fully. “I want to be really clear. I have an issue saying stuff about hardware, because I don’t want to trick people into thinking that I use this hardware for a specific reason. Instead, I use whatever is available to me. There was a time when I fantasised about hardware gear, about having this or that keyboard, or monitors with a specific crossover point, or whatever, and spent lots of money buying some pieces of hardware. But none of that is valuable to me any more at this point. I am over it. The hardware does not matter. In this day and age and in this music industry it’s all about taste, it’s all about the ideas. 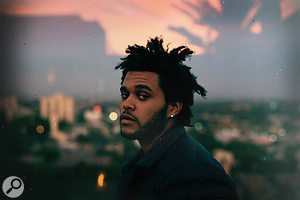 “In writing and producing material for his latest album, Abel [Tesfaye, aka the Weeknd] and I were in so many different studios and locations, and we were travelling so much, that I did not have a solid reference point. Sometimes I was sitting on a sofa with headphones on, sometimes I’d be in a studio working on NS10s, sometimes I’d be in Abel’s spare room using whatever speakers were there. In every place we used different mics, different mic pres, different monitors, and while it may have appeared like a nightmare to bring all that together, the technology makes it easy to do that. On his Facebook, Soundcloud and other social media pages, Montagnese describes what he does simply thus: “I paint sounds.” All sounds recorded and sourced in the “real world” serve as basic starting points for him to paint with and on, a bit like ‘found objects’ in art, and the painting takes place entirely ‘in the box’, where Steinberg’s Cubase functions as his canvas, palette, paint and brush. It’s how Montagnese approached his debut solo album, History Of Man (2013), which contains experimental electronic music in a similar vein to Aphex Twin and Autechre. It’s how he approaches his work with other artists on a rapidly lengthening credit list containing names such as Florence & the Machine, Lady Gaga, Drake, Wiz Khalifa, MIA and, of course, the Weeknd. In all these cases, Montagnese has managed to marry commercial adroitness with an experimental approach to painting sounds. 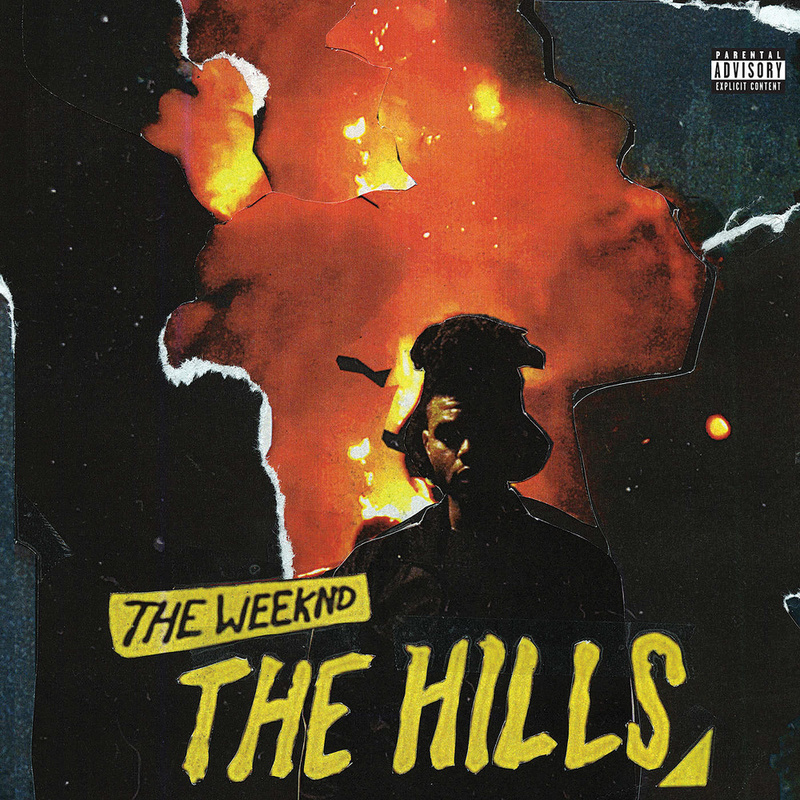 This was most ear–catchingly in evidence on the Weeknd’s US number-one single, ‘The Hills’, which combines a catchy melody with heavily treated vocals and all manner of sonic weirdness. 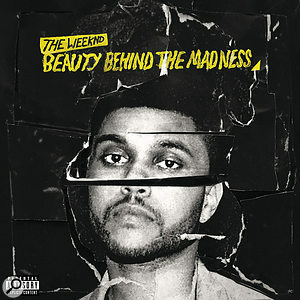 The album from which the single was taken, Beauty Behind The Madness, has proved a stunning commercial success, reaching number one in dozens of countries and gearing up to become one of 2015’s biggest albums. Montagnese had a hand in the making of seven of the album’s 14 tracks, and also executive–produced the entire album with Tesfaye and Jason ‘Daheala’ Quenneville. Also involved was legendary pop producer Max Martin, the driving force behind the first big hit off the album, ‘Can’t Feel My Face’. In a sign of the Weeknd’s omnipresence, that single was eventually bumped off the US top spot by ‘The Hills’ after the latter song had spent months roaming halfway down the charts since its June release. 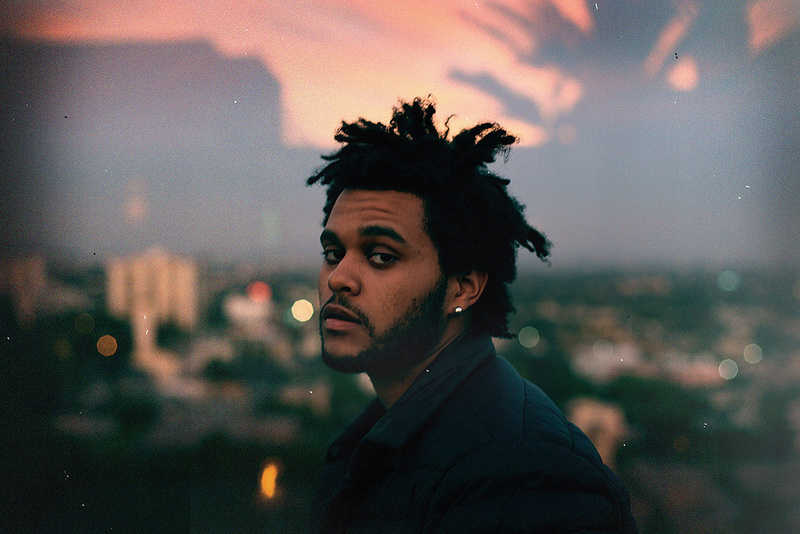 Carlo Montagnese has been working with Abel ‘The Weeknd’ Tesfaye since the start of both their careers.For Montagnese, the immense successes of Beauty Behind The Madness and ‘The Hills’ are a vindication of what he saw in Tesfaye when they first met, around Christmas 2010. ”I’m very optimistic and positive with anything I put my energy towards, so for me, Abel’s success now is what I imagined it always should have been. ‘The Hills’ was an opportunity for us to go back to the classical, original the Weeknd moments of our first mixtapes that I co–produced and mixed in their entirety, and then bringing that into a new context, with a pop arrangement and chords in a faster tempo. It’s the perfect marriage of that. “For most of the songs that I worked on for this album, Abel started the ideas with other people, and then when we come together I bring it home. Unlike the earlier mixtapes, there are only two songs on the album that I produced alone, ‘Dark Times’ featuring Ed Sheeran and ‘Prisoners’ featuring Lana Del Rey. But with all the songs on which I have a production role, I tie things together, play or replace sounds, accent sections, create or streamline transitions, do a lot of the drum work, vocal production and editing — whatever is needed to complete and finish it. Sometimes this is a lot, sometimes very little, as in the case of ‘Losers’, for which Labrinth sent me his arrangement. The Kanye song, ‘Tell Your Friends’, was already put together when I received it, so my involvement was recording Abel and locking in his vocals, creating the bridge and adding textures and sounds throughout. “When collaborating, people who use other DAWs simply send me WAVs, and I then load these into Cubase, and that’s when my work begins. It’s a process of chipping away at things and building them out. I’ve worked in Cubase for 12 years now, and I’m incredibly fast and efficient with it. I do everything: all my writing, producing, recording, tuning, editing and mixing in one session. Cubase is the one thing I couldn’t do without. But I’ve recently also been playing with Ableton, and that’s fun. I can work in it without looking at numbers or graphical interfaces, I’m just creating and throwing things together without quantising or treating them. 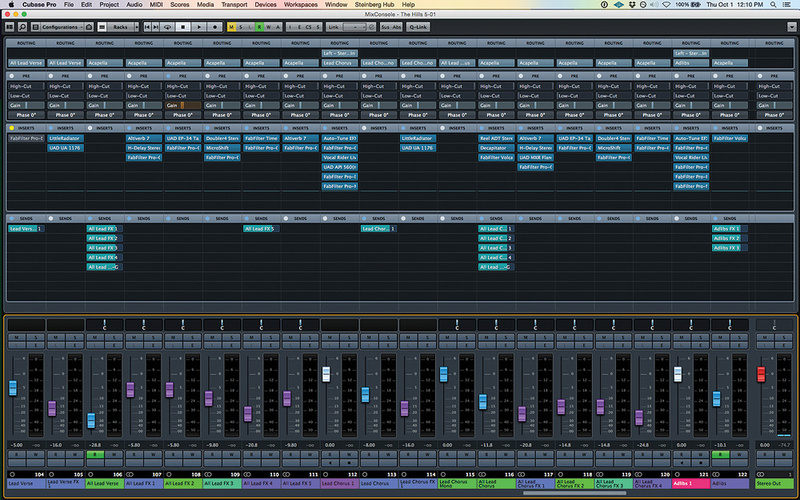 After that I Rewire things in Cubase, and get into the technical side and zone in on the details. It’s become an incredible workflow for me. 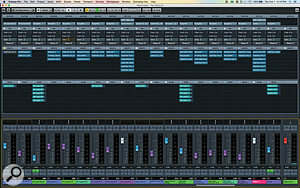 This huge composite screen capture shows the entire Cubase project for Illangelo’s mix of ‘The Hills’. Note the detailed automation on many tracks. Montagnese’s 153–track Cubase session for ‘The Hills’ is incredibly well organised. The most striking thing about it is that there are about 50 audio music tracks and 20 audio vocal tracks, meaning that more than half of the tracks are group and effects tracks. Montagnese’s working method appears to involve grouping several related audio tracks to one track, and then have sends from that track going to several effects tracks that are immediately adjacent. The audio music tracks contain five intro audio tracks at the top, followed by three verse bass tracks, a guitar track, several bass tracks, plenty of drums and percussion tracks, assorted sound effect tracks with bells, screams, voices, noise, and more, synth tracks, keys and piano tracks. As mentioned above, the audio vocal tracks consist of verse vocal, chorus vocal, backing vocals, ad libs and outro vocals. Verse lead vocal: Antares Auto–Tune EFX, FabFilter Pro–DS, Pro–Q2, Pro–MB & Timeless 2, Waves Vocal Rider, H–Delay & Doubler, UAD API 560, 1176 & EP34, SoundToys Little Radiator & MicroShift, Audio Ease Altiverb. “The first vocal track, called ‘Lead Verse 1’, has six plug–ins on the inserts. The chain starts with Auto–Tune EFX, which is an older version that pulls the vocal in a slightly different way than the newer versions. It’s funny: if you don’t pull a vocal through Auto–Tune these days, it almost does not sound normal! So you have to use it, though I apply it very subtly. You might not even notice it, but for me it makes a huge difference. After that the vocal goes to the FabFilter Pro–DS, because I wanted to take out some sharp sibilance — the microphone had grabbed his vocal in a way that was a little bit too bright. The DS is my favourite de–esser. Next in the chain was the FabFilter Pro–Q2, rolling off top end and low end. I wanted the vocal to sound lo–fi. “Below that is the Waves Vocal Rider, which is an incredible plug–in that saves me a lot of time in how it rides the volume. It allows me to keep his vocal in a good place. After that is the UAD API 560 EQ. I don’t use that EQ very often, but in this track, because the sonics have this marriage between classic lo–fi and a modern, sub–bass-heavy sound, I found that the 560 gave a kind of fuzz to the sound that really worked well. I shaped a delicate EQ curve with the 560, and then I ran the signal through the FabFilter Pro–MB for multiband compression to get a good balance between the low and high spectra of his voice. That compressor is really pumping! 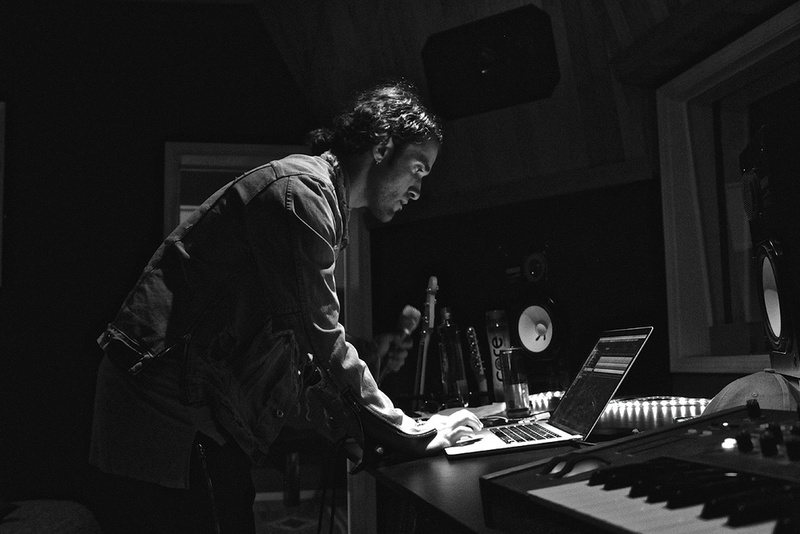 “These six plug–ins provided the core of how I wanted the verse vocal to sound. I then created a parallel compression track next to it, which goes to a send which has the SoundToys Little Radiator, with which I cranked up the heat a little bit, getting the vocal to sound a little overdriven, and I then ran that through the UAD 1176, again slamming it! I had these as a parallel compression track, because it allows me to balance the vocal tracks in a certain way to make sure the vocal is where it needs to be. “The lead vocal track and the lead vocal parallel compression track go to a group track called ‘All Lead Verse’, which allows me to quickly control both tracks at the same time, and I have five effect sends on it, going to five adjacent effect tracks. FX1 has Altiverb 7, which is my go–to reverb, then the Waves H–Delay for some pre–delay, and then the FabFilter Pro–Q2 EQ, which rolls off quite a bit of top end, to make sure the reverb does not sound too big frequency–wise. I like the FabFilter EQs: they are fast, with a great interface. FX2 has the UAD EP34 Tape Echo, which essentially is just a fast delay, giving it a slap, and I tweak that a bit with the Pro–Q2. The sheer number of plug–ins in use can be imagined from this shot of the Cubase mixer window, which shows just some of the tracks relating to the lead vocal! Chorus lead vocal: Antares Auto–Tune EFX, FabFilter Pro–DS, Pro–Q2, Volcano, Pro–MB & Timeless 2, Waves Vocal Rider, Reel ADT, H–Delay & Doubler, UAD API 560, 1176, MXR Flanger & EP34, SoundToys Little Radiator, Decapitator & MicroShift, Audio Ease Altiverb. “The chorus lead vocal track is ‘Lead Chorus 1’, and I have almost the same plug–ins on it as on the verse vocal, with similar settings, just to get the core of the vocal where I want it to be. I have parallel compression on this as well with the Little Radiator and UAD 1176. Both vocal tracks go to ‘All Lead Chorus’, and on the inserts here I have the Waves Reel ADT Stereo. It functions as a doubler, and adds a texture that gives more power. 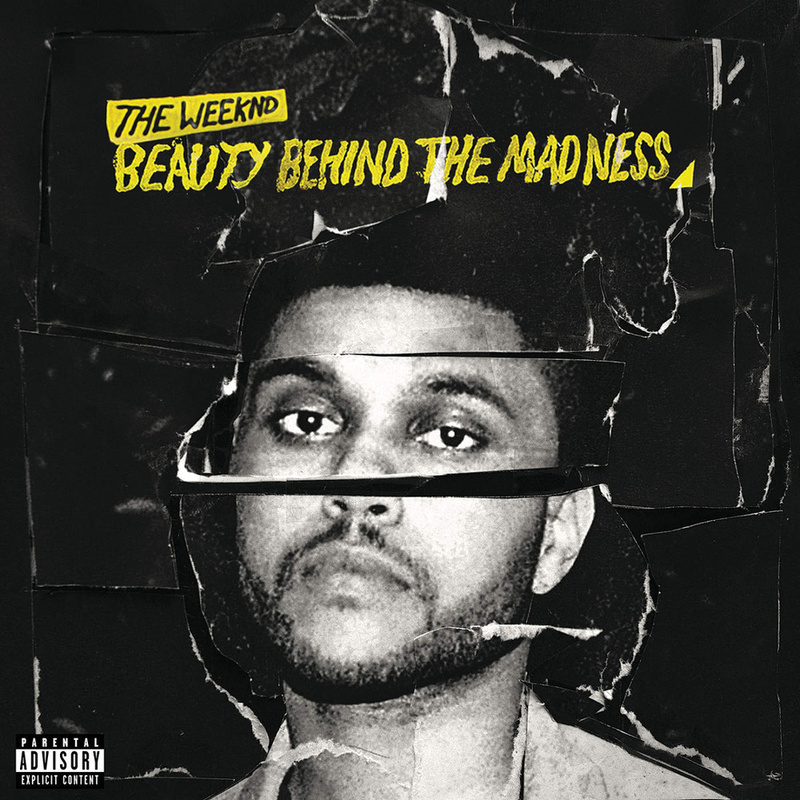 Instead of Abel singing the part twice, I artificially created that effect like this. Then there’s the Decapitator, which supplies the main distortion on the chorus vocal. I pressed the Punish button and drove it just a touch. The result depends on what you feed into it and how hard. But the distortion won’t do anything by itself. It’s just one piece of the puzzle, there are many more! The next insert is the FabFilter Volcano filter plug–in, to filter out some of the harmonics the Decapitator adds. I’m also modulating different LFOs and panning, to give the vocal some movement, some waves, some life. I’ll do this on a lot of records, where I’ll play with filters and panning to sway the sound around. Vocal ad libs, backing & outro: Antares Auto–Tune EFX, Auto–Tune Live & Harmony Engine, FabFilter Pro–DS, Pro–G, Pro–Q2, Volcano & Timeless 2, Waves Vocal Rider, & H–Delay, UAD API 560, 1176, EP34, Pultec EQ, Teletronix LA2A, MXR Flanger & Cooper Time Cube, SoundToys MicroShift, Audio Ease Altiverb. “The main ad libs track again has a similar set of six plug-ins as I have on the chorus vocals, with the Auto–Tune EFX, Q2, Vocal Rider, FabFilter Pro–Q2, Pro–DS and Pro–G [gate], and it has a parallel with the Volcano, on which there are three sends, to FX1 with the UAD EP34 Tape Echo, FX2 with the FabFilter Timeless 2 tape delay, and FX3 with the H–Delay, Altiverb and Q2. “Almost all backing vocals have five plug–ins on the inserts, the Auto–Tune Live, Pro–Q2, Vocal Rider, Pro–G and Pro–DS. I use the Auto–Tune Live because it pulls the tuning a little differently and has a slightly more natural sound than the EFX version. The backing vocals had to be finessed and tuned in a bit, but I wanted them to sound natural. The Q2 shapes the EQ curve, but I wanted more high–frequency info in the backing vocals, they didn’t need to be so lo–fi. The Vocal Rider once again allows me to easily dial in the levels, and then there’s the Pro–G gate — I really wanted to make sure any background noises were suppressed as much as possible — and finally the de–esser grabs some peaks. All plug-ins have the same settings, apart from the Q2 — the EQ settings are different for each vocal — and I adjusted the pre–gain for each track. “I spent a lot of time blending the backing vocals, and they then go into a stereo group track called ‘All Back’, on which I have five inserts and four effect sends. On the inserts are the UAD Pultec EQ, doing some attenuation on the low end, and two mono instances of the UAD Teletronix LA2A, because I wanted to be able to compress the left and right channel independently, and then there’s another Pultec EQ, boosting high end to make it cut through, and finally another 560, to shape it some more, mainly cutting things. The sends go to ‘All Back FX1’, which has the MicroShift, FX2 has the H–Delay going into the UAD MXR Flanger for some movement, FX3 has another delay, the Timeless 2, and FX4 again has the H–Delay, with a modulating delay, and then another instance of the Altiverb, and the Pro–Q2 shaping things some more. The music: iZotope Ozone, Cable Guys Volume Shaper, UAD MXR Flanger, API 560, EP34, Brainworx BX_solo, API Vision, EL7 Fatso, AMS RMX16, Pultec EQ & API 560, SoundToys Decapitator & MicroShift, Waves Renaissance Bass, L1, L2 & Reel ADT, FabFilter Volcano, Pro–Q2, Pro–G & Pro–MB, Audio Ease Altiverb, Sugar Bytes Artillery 2. “At the top of the session is the intro, which is like a distorted guitar–type thing, played a fifth above the root note of the song. We wanted the song to start very aggressive, very striking, so we had these different stabs, and within each stab there are different textures and layers. The tracks are ‘Intro’, ‘Intro Bell’, ‘Intro Hit’, ‘Intro FX 1’ and ‘All Intro Hit’. Various plug–ins I use are the iZotope Ozone to change to sound, it was a bit wonky to begin with, and the Cable Guys Volume Shaper, to adjust the transients and get the slope the way I wanted it. The original samples did not quite have enough punch. “Next down is the ‘Intro Rise Synth’, which creates a small transition effect into the verses, and the ‘Sweep’ synth sound, which consists of many tracks bounced into one. The ‘Verse Bass Side’ and ‘Verse Bass Mid’ tracks sound in the verses, and I wanted the side bass to pulse differently, so I had two instances of the MXR Flanger on it, while the ‘Bass Mid’ goes through the Decapitator. They are combined to the ‘All Verse Bass’, on which I have the Waves Renaissance Bass, API 560 and FabFilter Volcano, and I have all these filters automated, so they create movement. “Below that is the guitar, which I played and which also sounds in the verses. It has the Decapitator and the Reel ADT Stereo plug–ins, and two effects tracks, with the UAD EP34 Tape Echo, Altiverb and Q2, and the Sugar Bytes Artillery 2, and again you can see the automation moving and flowing. The claps are a very generic sound from an 808 library, and I wanted to keep it simple, mono and dead in the centre. The Brainworx BX_solo makes sure it’s in mono. “‘Bell 1’ is a small bell noise that sounds throughout the song, and it comes from a VST keyboard. It has the MXR Flanger, and FabFilter Volcano and Pro–Q2, and Altiverb 7 and EP34 Tape Echo, and again the Artillery 2, and the project window shows a bit of how much these filters are moving. I build it from a low where all the high end is rolled off, and it slowly progresses as it opens up more. It’s all the way open in the chorus, and then it slowly goes back down again. It’s a matter of creating movement to accent sections. Yes, there are a lot of effects, and it’s about getting the right sounds in the right place. So much of my work revolves around sound design, so that’s why you see all these sounds and plug–ins here. “The scream occurs just six times, and below that are several ‘Vinyl Hi–Hat’ tracks. I found this great little vinyl static noise sample and layered it. In the chorus you can see many different 808 sounds, which are all grouped to a track called ‘808 Kit’, which also has an ‘808 Kit FX1’ track with plug–ins like the UAD API Vision, EL7 Fatso, L1, MicroShift, UAD AMS RMX16 and Pro–Q2. There’s also a separate ‘Kick’ track, a ‘Kick FX1’ track, and a ‘Sub’, and they’re grouped together to a ‘Kick + Sub’ track, where they’re glued together by the Decapitator, a UAD Pultec EQ and the L2. The Pultec added some low end, around 30Hz, and the L2 made sure that the kick and the sub had a maximum, I did not want to push them higher than where they needed to be. They needed to be dead–on, so the L2 is more used as a safeguard. Stereo bus: Slate Digital VTM, FabFilter Pro–MB. “I had some plug–ins over the stereo bus, even though I have driven myself crazy over the years with many different stereo bus plug–ins, and in the end found that it doesn’t matter. You can get to the same point using different plug–ins. On this song I used the Slate Digital VTM virtual tape machine, which gives you the flexibility to decide how much you want to push the bass in the Settings tab, and which has very realistic hiss noise. On History Of Man I actually used tape, to hear what it would do to my sounds, and when I used the VTM, I found that they dialled that sound in spot on. I also used the Pro–MB, very subtly, just to glue everything together in the song. “I did 42 mixes of this song. Forty–two! All of them were about finding the perfect balance. It’s not a typical record where you just dial in the kick and the snare which go front to end. Instead there are these different sections, emotions, things that rise and drop. There’s a lot to it, and we went through 42 mixes to get it right. It was a nightmare, man! We did this in Abel’s house, fine–tuning things in 1dB increments, listening to his speakers, on the stereo in the family room, in the car, wherever we could. Now 28, Carlo ‘Illangelo’ Montagnese takes the modern approach to making music to an extreme, with every significant move done in software. Unsurprisingly, Montagnese also learnt his skills in typically 21st-century fashion: he’s self–taught, and the Internet is his main source of information. Montagnese was born in Calgary, Canada, in a musical family, and got into music, “pretty much the moment I was born. My older brothers and sister made a studio in the basement in the early ’90s. I was listening and watching everything they were doing. My oldest brother taught me to play piano. When I was a little older I asked him to show me how to sequence on an old Roland, and he told me that I could find all the info I needed online. So I spent a lot of time using all these online resources, including SOS’s Inside Track series. My home studio gradually developed, and when I was 16 someone told me that Cubase was the professional software to use, so I downloaded a cracked copy and learnt my way up from there. I was doing everything, as I still do today: writing, playing, engineering, mixing, producing, mastering.